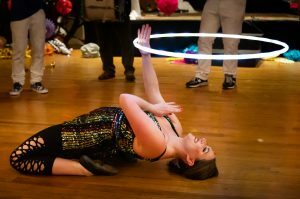 Jessie Jewels is a multi-disciplined dancer from Rhode Island specializing in hula hoop. Soul In-Motion is a group of friends from Southern New England who enjoy creative collaboration and impromptu improvisation. The group fuses together multiple art forms such as music, poetry, spoken word and movement arts. Performing in the ensemble is Greg Carpenter (Flute), Yeshua Fonse (Percussion), Jason Karol (Percussion), and Jessie Jewels (Movement). Jessie Jewels and Soul In-Motion will dazzle your eyes and ears with LED-illuminated electricity.